Never leave home without a power inverter. Whether you’re headed out on a camping trip or just want to make sure you’re always safe on the road with some extra appliances, the Power Bright APS1000-12 Pure Sine Power Inverter won’t leave you hanging. This definitely isn’t the largest power inverter on the market, but it can still throw plenty of power your way. This Power Bright model will provide you 1,000 watts of continuous power and can hit twice that rate for peak power. So you won’t lack electricity when you need a lot of it. Its output comes by 12 volts of pure sine waves, which means you’re getting the exact same juice you would in your home or anywhere else powered by a utility company. In some cases, what this inverter provides may actually be better because it outputs a pure sine wave. It will plug right into a 12 volt DC battery and is a perfect unit for powering televisions, game consoles, laptops, just about any other mid-sized consumer electronic or small appliances you have in your vehicle. Best of all, it provides a consistent charge, so you don’t have to worry about stop and start nonsense getting in the way of the electricity you need. If necessary, you could run this inverter for 24 hours straight without a hiccup. As you would expect, the Power Bright comes with a thermo cooling fan built right in. If you plan on using this machine for a long period of time, it would work great. If that is your plan, we definitely recommend that the power inverter you purchase has a built in thermo cooling fan in order to prevent overheating. However, the fan doesn’t go off until it finds itself surrounded by 100 degree temps or it’s been running for a long time in 85 degree temperatures. The unit is also built to last in that it the entire thing is wrapped in anodized aluminum. So if heavy duty wear and tear comes along, just pick this inverter up, dust if off and get right back to what you were doing. It can take a serious beating. This is especially impressive considering it doesn’t weigh more than 10 pounds and is only about 9 inches by 17 inches and 3.3 inches thick. So you’ll have no issues with storing this unit or otherwise taking it where you want to go. 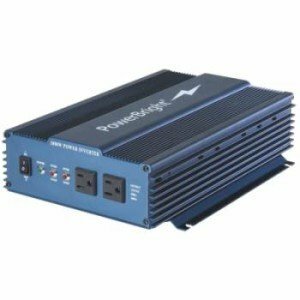 For the Power Bright Inverter, you’ll need to spend approximately $280 on Amazon (which is a significant discount from in-store models that retail for nearly $400). That’s a solid investment, but you need to remember all the benefits you’re getting with it and the many positive reviews this machine has received. Plus, if you wanted a similar unit, you’d end up probably spending at least $400 and still might not be happy with it. You get a lot of inverter in this package for not a lot of money. It’s hard to think of anything wrong with the machine, too, considering how well it works and how consistently it performs. So if you have mid-sized electronics or appliances you want to make sure you can always use, the Power Bright APS1000-12 is a great resource for them. My name is William Taylor. I would like to order the Inverter Power Bright from your company. kindly let me know if you have that available in stock please.And i would also like to know the payment methods you accept.